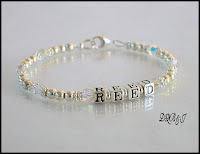 I've been very busy making new bracelets for DQB&J today. Not that I mind, it was way too hot to be anywhere but in front of the air conditioner! Welcome to the beginning. For those who don't know me my name is Dawn and I am the owner and the sole designer for Drama Queen Bows & Jewels & Its all About the Jewels.I absolutely love what I do but I find myself spending far too much time on the computer and not enough time dong what I truly enjoy-creating. I figured setting up a forum for me to comunicate with my customers from both sites instead of constantly going back and forth between them might save me some time. I will also be using this site to showcase my newest items,hold contests and announce sales(some exculsive for my blog subscribers). Now and then I will be intruducing some sites I love, products I can't live without and just some basic chatting. I hope you enjoy your visit here and I eagerly await hearing from you! It's time for my annual Christmas in July sale. Everything and I mean everything on the site is 25% ! Sale runs today until July 17th. Click on over to http://www.dramaqueenbows.com/ to start saving. I cannot think of a better way to start this blog then celebrating one of the people I love the most. Today is my darling daughter Gabriella's 10th birthday. I can't believe I have a 10 year old! The time went much too fast. Happy birthday Gabriella. I love you so very much. So put down your new DS and give me a hug!